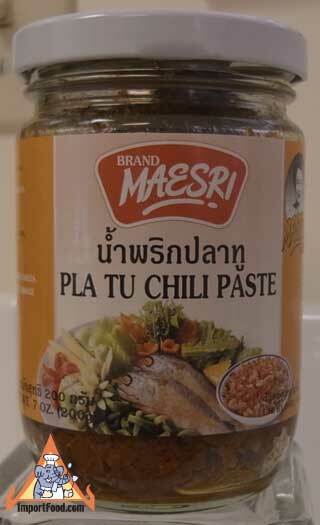 This is a hometown favorite "namprik" paste from Maesri brand, who we find makes the finest quality chile pastes. There's nothing like it, a true taste of home for a Thai person. Beware it's strong smelling with a bold flavor. Spoon this over freshly-made jasmine rice, mix it up and enjoy the great flavor of Thailand. Add meat, boiled eggs or vegetables to the mixture, or just eat with rice. You can also put some in a dish and serve as a dip for fresh vegetables (we particularly like it with cucumbers and string beans). It is "medium spicy", not flaming hot. Ingredients: chili (35%), mackerel fish (24%), shallot (18%), garlic (10%), fish sauce (6%), lime juice (4%), sugar (2%), msg (1%). No colorings or preservative added. Product of Thailand.